YAOUNDE, Jan 23 2014 (IPS) - The Cameroonian government has begun a crackdown on illegal medical facilities and plans to shut down more than 524 medical training centres and 600 private clinics operating unlawfully in this Central African nation. “We are starting activities to bring order to the medical sector that has gone out of control. Most of [the illegal medical institutions] lack the training, appropriate staff, equipment and infrastructure to operate either as a medical training institution or a clinic,” Biwole Sida, the national health inspector in the Ministry of Public Health, told IPS. 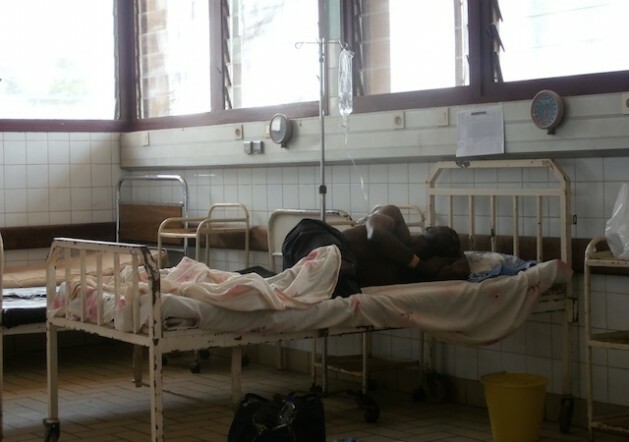 “The uncontrolled number of clinics and training institutions are responsible for the death and worsening medical conditions of many innocent Cameroonians,” Sida added. In the student residential area of Bonamusadi, in Cameroon’s capital, Yaounde, IPS visited one such clinic that is open 24 hours a day and which provides a wide array of medical services, including prenatal and paediatric care. But a patient who was rushed to this private clinic with burn wounds was turned away and taken to the nearby government hospital, Yaounde Central Hospital, as the clinic has stopped admitting emergency patients. “We now operate only by appointment since the government announced [it was] closing down clinics,” Helen Evinga, the clinic attendant, told IPS. Francois Penda, a medical officer at the emergency unit of the Yaounde Central Hospital, who attended to the burn patient transferred there by the private clinic, explained that it would not be a bad thing if the illegal clinics were shut down. “Most patients come to the hospital on the verge of death after they wasted time in small private clinics, which are not even equipped technically and professionally to handle emergency cases,” he told IPS. “A [burn] accident like this is so complicated and requires very delicate and sophisticated medical resources. Any unprepared attempt [to treat the wound] will complicate the patient’s chances of recovery,” Penda said. However, some private clinic operators claim they are providing a much-needed service as the cost of medical care in government hospitals and clinics is prohibitive. “There is a great need for the services of private clinics in Cameroon. The government structures fell short to satisfy all classes of patients, and are usually saturated with patients, making it difficult for them to receive fair treatment,” Maxwel Fonyu, a laboratory technician and owner of small clinic in Yaounde, told IPS. He argued that millions of people living in urban slums depend on the affordable medical assistance provided by these private clinics. “In my clinic, for example, instead of demanding 10 dollars for a malaria test like in big hospitals, I only charge them one dollar to conduct malaria tests, and prescribe and sell medicines that are affordable and vital for their treatment,” Fonyu said. Bidjogo Atangana, secretary-general of Cameroon’s National Medical Council, told IPS that the existence of the illegal and ill-equipped clinics was partially because of the government’s liberalisation of the sector some two decades ago. “In the 1990s people were authorised to open health clinics as a Common Initiative Group (CIG) [a non-profit], which is one of the easiest means to acquire a licence for such ventures,” Atangana said. Today the National Medical Council wants all medical centres that have been operating as CIGs to close down and obtain proper qualifications and medical licences, which many do not have. “Nobody will hence own such a structure without authority from the Cameroon National Medical Council, and the training offered in some health institutions must also be checked,” Atangana said. But according to Etienne Tsou from the health science faculty at Cameroon’s Catholic University, there is a need to regulate more than just the clinics, as most training institutions operate illicitly. “I don’t see how a medical professional can be trained on the job and not have a formal education. Most retired nurses and doctors think they are qualified to open their own centres and train others when they don’t have what it takes,” he told IPS. According to the Ministry of Health, about 5,000 Cameroonian medical doctors are currently plying their trade abroad. Tetanye Ekoe, the vice president of the National Order of Medical Doctors in Cameroon, said that out of 4,200 medical doctors residing in Cameroon, only about half are practicing as medical doctors. Of the other half, about 1,000 are on secondment to the Ministry of Health where they perform mostly administrative tasks. The remaining 1,100 are either with the Faculty of Medicine and Biomedical Sciences at the University of Yaoundé I, with NGOs or the private sector. More than 500 medical doctors and 5,000 nurses graduate annually in Cameroon. But Ekoe explained that the limited number of practicing medical doctors in the country makes the World Health Organisation doctor-patient ratio of one doctor per 10,000 inhabitants unrealistic in Cameroon – a country of about 21 million people. “The real ratio is closer to one doctor per 40,000 inhabitants, and in remote areas such as the Far North and Eastern Provinces, the ratio is closer to one doctor per 50,000 inhabitants,” Ekoe said.